The Senate Blue Ribbon subcommittee headed by senators Aquilino Pimentel III, Allan Peter Cayetano and Antonio Trillanes IV had been vocal about asking Vice President Jejomar Binay to face the plunder charges against him and to explain the assets and properties that had been linked to him and his family. It has been said that he is using dummies where titles of lands had been transferred to his former aides and their family members yet still have the full control and access over the properties. The most recent rap was when Antonio Tiu attended the hearing and had been grilled by senators Cayetano and Trillanes pinpointing that the controversial 145-hectare in Rosario, Batangas which he purchased from Laureano Gregorio Jr. brokered by his close friend Martin Subido was the very “Hacienda Binay." During the probing, Tiu has no land titles to show and only presented tax declarations and a one-page, un-notarized Memorandum of Agreement that had been signed by Tiu and Gregorio, from whom he bought the property. According to the research conducted by GMA News, the property, which is now converted into an agri-business park, is believed to be owned by the Binay family. It was late July of this year when the investigation started with a 9-page complaint that had been filed with the Office of the Ombudsman Renato L. Bondal and Nicolas "Ching" Enciso VI wherein Binay was accused that during his mayoral term in Makati City, he violated the Anti-Graft and Corrupt Practices Act in relation to the Anti-Plunder Law. 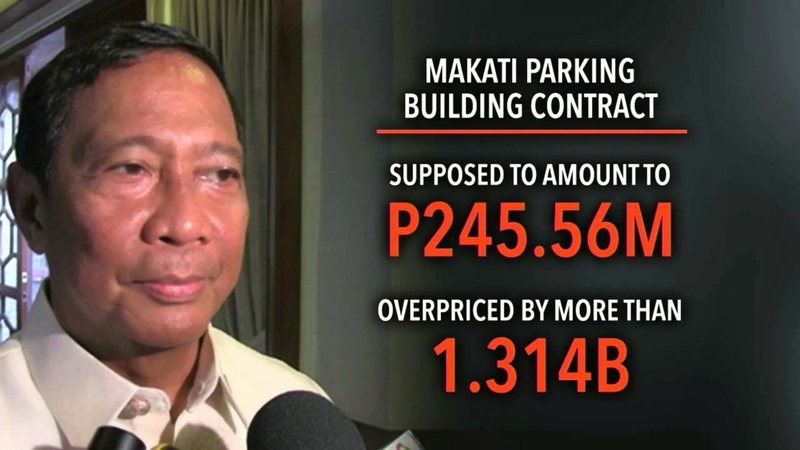 According to the complaint, the then mayor plundered public funds in reference to an over-priced multi-million-peso 11-story new Makati City Parking building project. Investigation revealed that upon estimation, it was supposed to have amounted to only P245.56 million but was rather overpriced for more than P1.314 billion and the final contract price was at P1.56 billion for which it has been tagged as “the most expensive parking building in the country-if not the entire world”. Cavite Governor Jonvic Remulla, Binay's spokesperson for political concerns though made a statement that the Binays have nothing to hide and that the Vice-President is confident that it will be dismissed. He said that Binay is innocent until proven guilty. He instead reiterated that the allegations against the plunder charges is a political plot as a part of a demolition tactic backed up by the current administration's allies to ruin his chances in the 2016 presidential elections. The Binay camp had been doing similarly active with legal actions to stop the Supreme Court from its continuous probing against the Vice President’s plunder allegations. Contrary to Senator Trillanes’ 3 weeks plea ( November 22) for Binay to face the corruption charges, the Vice President doesn't want to face the subcommittee hearing, dubbing it as ‘circus-like’ probe, because of what the three senators are doing. He said Binay has yet to decide whether to attend the Senate Blue Ribbon committee hearing scheduled Nov. 6. President Aquino already made a statement that, “If he (Binay) thinks we’re taking the wrong direction, he can always avoid our initiatives. But as Vice President of the land, he should be constructive by offering not just criticisms but solutions as well,” this is in reference to Vice-President Binay's criticism on how the government is being run.